The available feed resources can be grouped into four categories: forages, crop residues, agro-industrial by-products (AIBP) and non-conventional feed resources (NCFR). It is appropriate to briefly discuss each of these categories. These include grasses (native and introduced) from pastures, non-pasture situations (e.g., fodder belts) and tree leaves from both annual and permanent tree crops. The latter category is usually not considered in pasture and fodder development. In recent years, there has been increasing recognition of their potential value and use by farmers, in view of the variety of tree leaves available for feeding both ruminants and non-ruminants. Crop residues are mainly fibrous materials that are by-products of crop cultivation. Due to the intensity of and emphasis on crop production in Asia, these form a high percentage of the total volume of feeds produced annually. Notable within this category are the cereal straws on which the majority of the ruminant populations subsist. These cereal straws form the bulk of the fibrous crop residues and, in view of the abundant supply, most research has been directed at this group of feeds. Crop residues have a low crude protein content, in the range 3.3– 13.3% on a dry matter basis. This constitutes a basic limitation to the value of some of the residues (e.g., bagasse and rice straw) which are near the border line of 6–7% dietary crude protein required to promote normal voluntary food intake (VFI). Most of the crop residues are deficient in fermentable energy, reflected by the relatively low organic matter digestibility, and are also low in minerals. The term ‘agro-industrial by-products’ (AIBP) refers to the by-products derived by the industry from the processing of the main crop and animal products. They are less fibrous in comparison to crop residues, more concentrated and generally have a higher nutrient content. Good examples of AIBP are molasses, rice bran, pineapple waste, palm oil mill effluent (POME) produced from refining palm oil, and coconut cake. In this publication, for reasons of brevity, AIBP is used to include crop residues in general. Non-conventional feed resources (NCFR) are identified separately but they form a component of AIBP. The main reason for doing this is to draw special attention to the magnitude and importance of this particular resource base and its economic value. They are currently under-utilized and their is much potential for expanding their use by farmers. NCFR refers to all those feeds that have not been traditionally used in animal feeding and/or are not normally used in commercially produced rations for animals. Defined in this manner, NCFR embraces a wide diversity of feeds that are typical of and abundant in many countries. Most of the traditional feeds of crop origin tend to originate from annual crops. NCFR, by comparison, includes a variety of feeds from annual, perennial crops and feeds of animal and industrial origin. It is not easy to draw a distinct demarcation between traditional feeds and NCFR. This is because, in some countries such as Malaysia, what was classified as NCFR may now be subject to increasing emphasis of use. A good example is wheat straw which is very widely used in that country. Palm kernel meal started off as a non-conventional feed but is now being increasingly used by feed millers. Devendra (1992b) has recently published an assessment of non-conventional feed resources in Asia and the Pacific, including strategies for expanding utilization at the small farm level. Estimating the amount of cereal straws that are produced. These include maize stovers, millet, rice, sorghum and wheat straws. Estimating the total amount of AIBP produced from field crops. A total of 11 feeds were identified in this group and included castor bean meal, cassava leaves and waste, cotton seed meal, maize germ meal, rapeseed bran and meal, broken rice and husks, sugar cane bagasse and green tops. Quantifying the total amounts of the feeds produced from tree crops. These included cocoa bean waste and pods, coffee by-products, palm press fibre, palm kernel meal, palm oil mill effluent and rubber seed meal. Table 5.1 presents a summary of the situation. Appendix 4, Tables 1, 2 and 3 present the amounts of cereal straws and AIBP produced from field and tree crops. It is apparent that the total production of cereal straws and AIBP from both field and tree crops accounted for 219 million tonnes in 1989. Of this amount, it is estimated that 32.2% or 70.5 million tonnes are NCFR. Attention is drawn to the fact that the production of NCFR is very much higher than these figures suggest, as the calculated data do not include the production from a variety of other field crops, statistics for which are not available in the FAO data. Additionally, there are also residues and wastes from animal sources and the processing of food for human consumption which have not been included in the calculations. Finally, there also exist an abundant variety and supply of shrubs and tree fodders that constitute valuable feeds for animals in the region. Table 5.1 Availability of feedstuffs other than grasses in South-East Asia. ** Of this, approximately 70 million tonnes or 32% is considered to be NCFR. It is stressed that approximately 80% of the NCFR from field and tree crops are principally suited to feeding ruminants. The utilization of these feeds and other fibrous crop residues by ruminants thus represents a most important function of these animals in South-East Asia. They may, at the present time, be making the most efficient use of these feeds and converting them to useful animal products of value to man. It is not intended to discuss this subject in detail other than to draw attention to the availability of extensive published information in several countries: Thailand (Holm, 1971), the Philippines (Zamora and Baguio, 1984), Malaysia (Devendra, 1979a) and Indonesia (Hartardi et al., 1980). Based on the available data, tables of feed composition applicable to South-East Asia have been published (Harris et al., 1982). Current methods of using fibrous crop residues (FCR), together with other feed ingredients, are varied and generally haphazard, in terms of providing a balanced nutrient supply to meet both the energy and protein needs for animal production. This inefficiency has largely contributed to the continuing low productivity of animals in feeding systems and there is considerable scope for improvement. Feeding ruminants in small farm systems is closely linked to the type of production system that is used in individual countries. A comprehensive discussion of these systems is given in the following sections. realization of a premium price for ranch-produced beef. The total number of animals and people that benefit from the kind of extensive system described above is relatively small. Although output per man is high, the capital investment is also high. The latter includes cost of stock, fences, wells, pumps, handling yards and buildings. Roadside, communal and stubble grazing. The three are not mutually exclusive. Grazing on roadsides and communal (waste) land may be practised by landless stock owners as well as others when their privately owned lands are under arable crop cultivation. Grazing in rice fields is restricted to periods immediately after harvest when the feeds available consist of the aftermath of the rice crop (viz. rice stubble and some regrowth), any weeds which grow in the paddies, the grasses that are found on paddy bunds and browse from shrubs and trees that grow on it. Where multiple cropping is practised, the crop aftermath may be burnt after harvest and stubble grazing may be severely restricted or non-existent. Tethering is very common throughout South-East Asia and is adopted when there is a need to prevent animals wandering into areas being cropped and also to ensure that they graze down the available feed in a given area before they are moved. This type of confinement feeding is popular in all countries because multiple cropping is very wide-spread in this region. The animals may be tethered on waste grazing areas close to the farm, on rice fields after harvest to regulate stubble grazing or close to stacks of rice straw to allow self-feeding. In the cut-and-carry system, a large proportion of the feed is usually brought in from outside the holding because of the small size of holdings in relation to the number of animals kept. The system is subject to the vagaries of scasonal abundance and shortage of forage that are characteristic. Since the livestock are housed most of the time, this results in a growing dependence on increased capital costs of infrastructure and also the use of high priced concentrate feeds, especially during lean periods. As one would expect, the cost of feeding and production in the cut-and-carry system is very much higher than that of grazing, as the results from a study of dairy cattle under simulated small farm conditions showed (Wong et al., 1987). On the other hand, land is a major constraint in places like West Java where stall feeding is normal. Only limited success has been achieved with ruminant production systems that have evolved in association with arable cropping in South-East Asia. This is not surprising when the primary requirement is that all arable land must be used for food crop production and the availability of cultivated forage for animal feeding is limited. Also, the majority of the ruminants (certainly the large ruminants) in this region are maintained mainly for products or services of a non-food nature (e.g., draught power). Increased fertility of the land via the return of dung urine. Control of waste herbage growth. Provision of shade and reduction of heat stress. Easier management of the crop. Distinct possibilities of increased crop yields and animal products from the land. Efficiency of natural resource use and sustainable development. Plate 5. The integration of small ruminants with tree cropping systems (coconuts, oil palm and rubber) is becoming an increasingly important production system in South-East Asia. 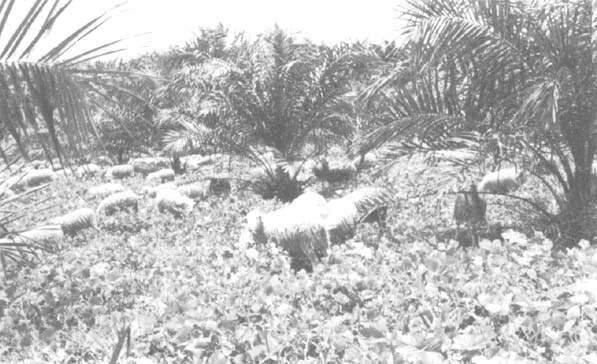 The photograph shows sheep integrated with oil palm in Malaysia. It is of course recognized that the sale of animals and their products do add to the returns from the system but little or no effort has been made to maximise their contribution. In consequence, the stock-carrying capacity of land under tree crops is much more variable than under any other system. Associated with integrated systems involving tree crops is the increasing attention being given to the value of multi-purpose trees. The use of these multi-purpose trees in integrated systems with tree crops as fencelines, and especially forage production as feed, promotes the development of sustainable crop-animal systems with complementary advantages of forage production, supply of fuel wood, improved soil fertility, maintenance of soil cover and environmental protection. Provision of variety in the diet. Source of dietary nitrogen, energy, minerals and vitamins. Laxative influence on the alimentary system. Reduced in the requirements for purchased concentrates. Considerable diversity exists in the types of forage supplements of value, particularly to ruminants. The more important ones among these which are widely used in the developing countries are Acacia spp., Ficus spp., cassava (Manihot esculenta), Erythrina spp., Gliricidia spp., Leucaena leucocephala, pigeon pea (Cajanus cajan) and Sesbania spp. The potential value of these forages for ruminants has recently been reviewed by Devendra (1990a). The review reached a number of conclusions. Firstly, with all ruminants, the use of various forage supplements consistently increased live weight gain or milk production. Secondly, in many instances, the beneficial response (meat and milk) was associated with a reduced cost of production. Thirdly, of the forage supplements used, the leguminous forages have been particularly advantageous, among which Leucaena has been very popular. Fourthly, with only rare exceptions, the stall-feeding or cut-and-carry system was the most common production system used, compared with the grazing situation. Finally, with reference to large ruminants, the research on the value of forage supplements for draught animals is very sparse. Plate 6. Forages from multi-purpose trees and other crops are valuable and sustainable feed resources. 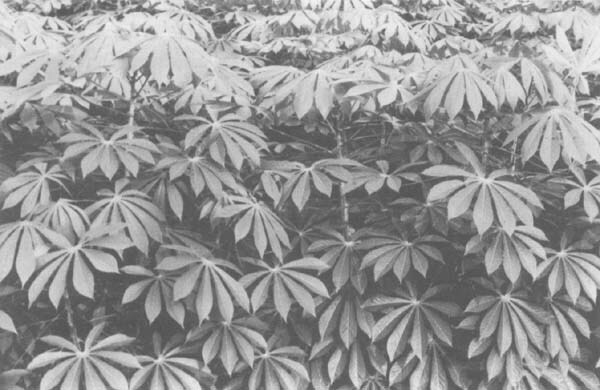 Cassava (Manihot esculenta) leaves is one example and is commonly used in all countries in South-East Asia. Supplementation of balanced nutrients is undertaken haphazardly for a variety of reasons, chief of which is an inadequate knowledge of the reasons and need for it, potential value of appropriate supplements, notion that energy rather than protein is a more limiting factor and inadequate demonstration of the relevance of and procedures to supply the desired nutrients. Strategic supplementation is now widely accepted as an important means to increase animal productivity especially on small farms. It is justified because of regular feed shortages that occur, such as during periods of droughts, and the fact that ruminants subsist for most of their life on fibrous crop residues on small farms. Create an efficient ecosystem for fermentation digestion of fibre in the rumen. Balance the products of fermentative digestion with by-pass nutrients of dietary origin in order to optimise the use of the available energy for productive purposes. Several alternative strategies have recently been pursued with the objective of making low quality forages much more useful for production (meat, milk or draught). Foremost in these initiatives are a variety of chemical pre–treatments, of which urea treatment is the most widely used, and the use of multi–nutrient blocks (Leng et al., 1991). The result has been a shift from a sub–maintenance to a maintenance situation, which is achieved by increased intake, increased digestibility or both (Ibrahim et al., 1984), and occasional growth (Perdok et al., 1984; Verma, 1983; Schiere and Wierenga, 1988) and milk production (Davis, 1983) responses. The use of forage supplements has been secondary to these efforts and is under–estimated. It is however an alternative strategy and, for small farmers who have access to some types of forages, it has enormous potential for application to ruminants (Devendra, 1990a). In this system, the animals (mostly indigenous and unimproved) scavenge on the feeds available particularly in village areas. These include mainly the residues form rice and cash crop cultivation and also kitchen remnants. In general, the productivity of the animals is low and mature weights are reached rather late. Pigs - slaughter weights of about 80 kg are reached in 6–7 months. - mature weight of 1.2–1.5 kg in about 16 weeks. - mature weight of 1.2–1.5 kg in 8–10 weeks. These systems involve some form of confinement with the use of the available feeds on the farm and some concentrates. The system usually applies where the farmer owns a relatively large number of animals and in situations where land is a constraint, in which case some form of confinement feeding is necessary. With pigs in small farm systems, the Lehmann system of feeding roots such as cassava (Manihot esculenta) or sweet potatoes (Ipomoea batatas) with limited concentrates is quite common. Forage supplements such as cassava leaves, sweet potato vines, water hyacinth (Eichhornia crassipes) and Ipomoea reptans are also added. These are often cooked and fed as a slop. Typical slaughter weights of 80 kg are reached in about 24–28 weeks. Where only concentrates are fed, slaughter weights are reached faster but this is unusual because of the rising price of concentrates. Intensive systems on small farms are rare because of labour constraints and particularly the preoccupation of the farmer with crop production. Additionally, inadequate credit and logistical difficulties prevent farmers from purchasing the necessary concentrates. An increasing trend in many countries in South-East Asia involves home–mixing of feeds using mainly indigenous ingredients. This trend needs to be encouraged to promote the more intensive use of the available feeds and also as a means to increase animal productivity. Production is scattered and the quality of feeds is often low. There are also problems of seasonality, processing and storage facilities. High cost of handling and collection. Non–competitive costs and low product prices. Processing is difficult and, in any case, problematical. In tree leaves and leguminous forage supplements, there are some deleterious principles which need to be removed to reduce the effects on animals. Table 5.2 provides a list of toxic principles found in some crop residues, AIBP and tree leaves. Lack of managerial and technical skills to utilize the feeds in situ. Lack of institutional and support services with the participation of farmers. Table 5.3 summarises the priorities for using AIBP and NCFR in South-East Asia according to their potential value and importance especially to individual species of animals. It categorises the broad types of feeds, their essential characteristics and the main species which currently utilize them. It is therefore appropriate to identify potential examples of AIBP which merit particular focus, and which can through interventions, make a significant contribution to improved performance and productivity from the animal resources. Table 5.4 presents a list of some examples of primary feeds appropriate to individual species by location. Both ruminants and non–ruminants are identified. In the former case, mainly meat animals including the use of the swamp buffaloes for draught and meat production are the species of choice. Irrespective of the choice of feed and location, acceptable and successful feeding systems are those that are simple, practical, within the limits of the farmer's capacity and available resources, and consistently reproducible. The approach at the farm level is to seek optimum rather than maximum performance. Moderate to low levels of animal performance may be biologically inefficient but could be more economically viable than high levels of performance, especially within the limitations of small farm systems. It is equally essential that, in order to ensure the utilization of research results and their impact, there be large scale on–farm testing of the potentially more important feeds involving participation by farmers. Table 5.2 Examples of toxic principles in some crop residues, agro–industrial by–products and tree fodders. Table 5.3 Priorities for the utilization of crop residues and agro-industrial by-products (AIBP) by animals in South-East Asia. Energy and protein (eg.rice bran, coconut cake, soyabean meal, poultry litter) High energy High protein Pigs, poultry, ducks, lactating ruminants. Good quality crop residues (eg. cassava leaves) High protein High energy Pigs, ducks, lactating ruminants and use as supplements in meat animals. Medium quality crop residues (eg. sweet potato vines) Medium protein Pigs, ruminants (meat and milk). Low quality crop residues (eg. cereal straws and bagasse) Low protein Very fibrous Ruminants (meat and draught). Table 5.4 Some examples of primary feeds for intensive utilization by location.